Are you cereus? : Welcome to "Are you cereus?" A blog about the night blooming cereus (Epiphyllum oxypetalum), digital photography, the weather and maybe a little bit more. Welcome to "Are you cereus?" 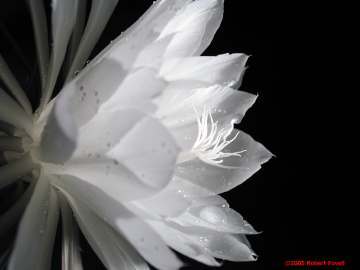 I've made this page as a companion to my website concerning photographs of the Epiphyllum oxypetalum, one of the cacti popularly known as "night blooming cereus". The site draws many visitors, particularly during (Northern Hemisphere) summer, and generates a fair amount of email. Some of my emailers describe (or show) their own plants or impart growing advice, while others pose questions I cannot answer. A weblog might provide a useful avenue for sharing comments, questions and pictures from other cereus owners, and those interested in this special plant. I'll probably also include pictures that, for whatever reason, didn't make it to the cereus website. Here's one to start off the blog. It was taken on 27 September 2004, in my backyard like all the others. Thanks for visiting, and please feel free to leave a comment! My class is reading Out of the Dust by Karen Hesse. Hesse mentions the cereus plant in her diary entry of September. However, our research stated that the cereus plant blooms in June and July. I noticed that some of your pics were taken in June, July, and September. When can a cereus plant bloom, and how long does it take the plant to open to a full bloom? In the novel, all the people of the town gathered to see the plant bloom. The class and I thought it was odd that the people would know which day to watch the bloom. I assume that they were waiting for the plant to come into full bloom. How many days does it take for the plant to completely open? (1) Our plant has bloomed -- or tried to -- as late as November, that bud having ceased development after a very cold (for Southern California) spell. I presume that if we lived in a still less seasonal place, such as Hawaii, the plant would bloom all year long. (2) Once the flower starts opening, it's completely open in a few hours, and only lasts until the next morning... at least for the cereus I have. The bud itself develops slowly enough to predict a few days in advance which night it will open. I have photographed the evolution of a single bud, which you can use to roughly gauge where in its development a particular bud is. Please see this page. (3) Technically, our plant is not a true cereus, though it is very often called one. I note somewhere on my cereus site I've seen an almost identical flower bloom on a spiny cactus. That flower was a daytime bloomer, and it's possible the flower lasted more than just a few hours. I have two Cereus plants, one that I grew from the mother plant that looks ok but not great, and the mother plant that I've had 30 years but which now looks awful and no longer has flowers. The leaves are red in color or dried up. What do I feed it? Where should it be located and how wet should the soil be? Hi Mr Fovell, I am a new cereus! and I have a quetion about how to plant this beautiful Night Blooming Cereus. A friend of my gave me three cuts from her plant and a plated them and regular soil and I am keeping them indors by a window. Is thi fine, please advise. I just ran across--essentially by accident--your website showing exquisite photos of night-blooming cereus. What gorfeous pictures! Thank you. My son gave me a cutting that he told me was night blooming cereus about 2 years ago. At that time, I looked around on the Web and found your site. The pictures and your comments encouraged me, and I have kept my plant alive. It now grows 2 to 3 feet tall every summer, and even has some branches. Last year I had 2 buds, and one got knocked off in the early stages. The other one had turned upward and grown a lot. I was sure it would bloom within a night or two. The next day we discoverd that something had eaten the end of the leaf, and the bud. It must have been a pretty big bug or caterpillar, to hold that much salad. This summer I moved the pot to a more protected area, and now we have a bud! This one has turned upward, and the narrow leaves on the outside of the bud are beginning to have cracks between them. In 2 or 3 days, I hope to be able to report that we have seen and photographed our first bloom that reached maturity. I have enjoyed your website and now the blog. Please don't stop posting your experiences on the Web. There are lots of us out here who enjoy knowing that someone else waits patiently for signs of buds, and then for blossoms. I have a question. We've had a night blooming cereus for a number of years here in Northern Virginia. It's very healthy, and I've seen it bloom a couple of times. My question stems from its good health. It has so many long shoots that it's growing up the walls and staircase. It's probably time to prune it, but I don't know when this should be done or if it could do damage. Could someone tell me. I'm new to this site but love the info it provides. Where are the answers to the questions people ask you? I rooted a leaf from a cereus and it has now sprouted 4 very long stems; I assume that is where new leaves will sprout. I know nothing about growing it but I live in Florida and keep it outside. Is it cold tolerant? Does it like sun? Thanks for the great pictures on your site, can't wait for mine to bloom if I don't kill it first. If you'd like a reply, the best way is to email parody805@gmail.com or leave a real email address in the comments. When you reply anonymously, I may get a notification, but I won't know which post you're replying to, and may not be able to find your question. In my experience, when the plant grows long stems, it is preparing to produce a lot of new leaves, and that's good. Unfortunately, this has been an unusually cold winter in Southern California, which is testing the cold tolerance of my outdoor plant. A series of very cold days in January caused its leaves to turn black and get very soft. It is not yet clear that the plant survived. My cereus bloomed with about 20 flowers. Gorgeous. I also had 2 blooms from a leaf I rooted that was still in the water, had not been planted yet. I had a cereus bloom of 20 flowers a month ago, then 4 more flowers weeks later then last week 2 flowers on a cutting that was still rooting in water! Fabulous. You have some beautiful pictures here. I would love for you to see some of mine but i do not have an editor i took the pictures with my phone and a flashlight some incredible shots i might add :) i want to share them with you and others just do not know how. may i email you? Is this a yard plant or an indoor plant? I read one comment that its only in the water and its blooming? Yes I am a cereus. The plant has been in my family for 3 generations. I recently learned of someone in India having a cereus but they called it "Christ Cradle", have you ever heard of it being called this? With regard to the question WHEN DOES CEREUS BLOOM, ONLY JUNE AND JULY OR AS LATE AS SEPTEMBER, my own experience is that there is a wide variety of possibilities based on a wide variety of factors. I live in Nigeria, 10 degrees north latitude. So it's warm all year round. 50 degrees F is about our coolest temp. But we have a distinct dry season beginning in October and ending in April. However the transition from dry to wet and back to dry is gradual. I have never had blooms in Nov Dec or Jan, but have had them from Feb to Oct. Humidity seems to be the main factor for my cereus, not temp. My dad gave me a cereus 20 years ago. He lived in North Carolina and I live in NJ. Since my dad is no longer alive, I treasure this plant. Each summer it is outside and indoors in the winter. It rarely blooms and has gotten so leggy and unwieldy that I don't know what to do. Reading this blog has been very helpful but no one has mentioned how to trim it properly. It must be cut back as it hardly stands upright even with a bamboo stake! I have been treating this plant with benign neglect and now it is time for me to really get serious! Help! I have a Night Blooming Cereus, and want to trim the stem back. How is this done safely, and can the stem be replanted too? I have recently planted some clippings and think that turned out a success for my brother. But need to know for the stems. one of our cereus' has a bloom that is now 3 days old....i have never had this happen before. Is this something anyone else has seen? I live in Orange County, CA and I have 2 cereus plants, one given to me by a neighbor (that has bloomed before) and another that I bought from someone. The first plant had leaves that were turning very yellow as she had the plant mostly in the sun all day. Once I got the plant, I put it in a mostly shady area, only getting a bit of sun in the morning, maybe about an hour of direct sunlight per day. The leaves started turning green almost immediately. Then a bloom sprouted. I was very excited! After a few days, the stem of the bloom turned beet red and it seemed to be very wilty to the touch. Within another day or so the bloom never had a chance & it died. Now on my my other plant (also located in the same shady area), the same thing is happening somewhat. Last week I noticed it sprouted a bloom. The stem has turned somewhat pinkish in color and the bloom is just dragging on the ground and looks like it will be dead in the next day or so, never having a chance to open. I know they have not bloomed at night already because I've gone outside at night to check. It is not the case that they are blooming & I'm missing it. The blooms are dying before they even open. I have been watering them about once a week but even that may be too much. I was hoping you might have some insight since this has happened to two plants, it must be something I'm doing wrong. I would really like to learn how to care for these amazing plants. Thank you! I'm a professor of atmospheric sciences (meteorology) at the University at Albany, State University of New York.